This 2-Stage Under counter filter system has shown effectively to remove lead, cyst and VOC’s(volatile organic compounds) from tap water. Only particles under five microns can get past its ‘sediment filtration’ stage, the first filter. Next comes the ‘one micron carbon filter’ where giardia and endamoeba cryptosporidium parasites are extracted. This is also when lead, VOC’s and cysts are taken out. Bear in mind, though, that the manufacturer clearly states a reduction in chemicals and not total elimination of them. Nitrates, commonly found in agro chemicals, as well as arsenic and chrome are not removed with this product. Flow rate and water pressure are reasonably good. Are you environment conscious and concerned about the huge number of bottles being dumped in landfills every day? You may have just found the solution in the Watts WP5-50 Premier Five-Stage Manifold Reverse Osmosis Water Treatment System. This water filtration unit delivers safe, pure water that is good for your health and tastes just like bottled water, without harming the environment! The innovative single piece manifold design of the Watts WP5-50 Premier Five-Stage Manifold Reverse Osmosis Water Treatment System allows a seamless water path, removing 17 different connections. Its 5 stage reverse osmosis system is tested and certified per ANSI/NSF standards. In the first stage, silt, rust, sand and dirt particles are trapped by a 5-micron sediment filter. In the next stage, the carbon block filter gets rid of chlorine and other odor causing, taste-changing materials. The third stage removes residual chlorine, and the water goes to the RO membrane, the ‘heart’ of the system. In stage four, sodium, copper, lead, arsenic, chromium and other dissolved solid contaminants are removed by the super-thin membrane, along with 99.95% of cysts like Giardia. The last filter, a superior GAC filter, is a polishing filter used to remove any impurities that may still be lingering in the water, and improve its taste. This unit comes with a storage tank of 3 gallons, and an automatic shut-off system that prevents water from spilling over once the tank is full. The water wastage in this process is also less compared to other Reverse Osmosis systems unless your water source is extremely contaminated. This product has a rating of 4 stars out of 5 in most online stores like Amazon, with customers stressing that even the most contaminated water was perfectly filtered through it and tastes good. They also mentioned that the product is affordable, easy to install and sturdy. 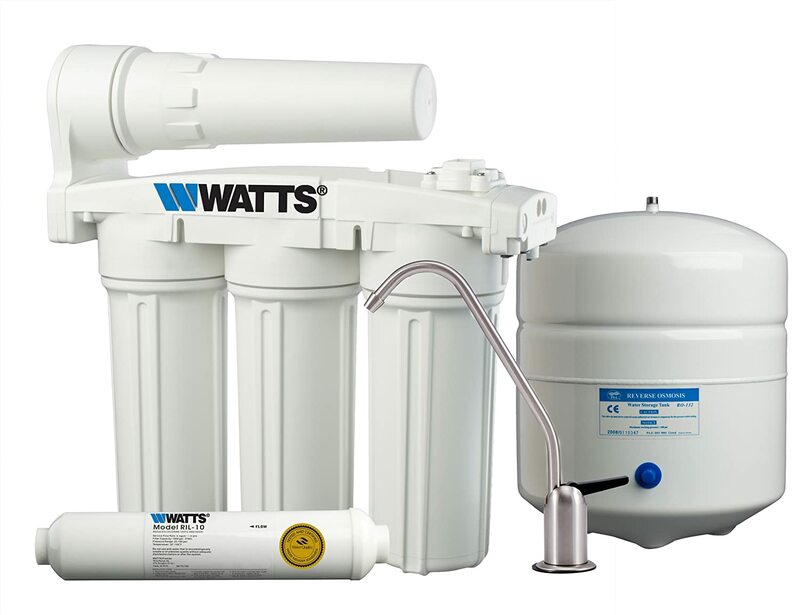 The Watts WP5-50 Premier Five-Stage Manifold Reverse Osmosis Water Treatment System is economically priced. It can purify highly contaminated the water and deliver pure, delicious water right at home, eliminating the need to buy expensive bottled water. Its installation is very much user-friendly. The durable and automatic shut off valve make it an ideal option for families and avid indoor gardeners. Solve your clean water dilemma and get yourself the Watts WP5-50 Premier Five-Stage Manifold Reverse Osmosis Water Treatment System now!